Our family have been cat lovers for over 50 years. My wife tells me the stories about her cats when she was 6 years old. 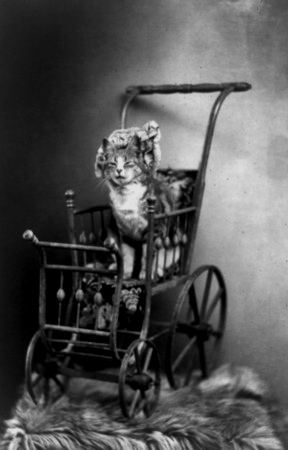 Mom and Granma would help Teetle dress up the baby cats and put them in the cat stroller for hours of play and fun. She told me how she loved playing with her babies and wheeling them up the lane to the top of the mountain and back again. Dressing each little cat with her favorite baby clothes that maw and gram maw had purchased at the Goodwill. So you can see from this picture nothing has really change in the past 100 years when it comes to little girls taking their favorite feline friends for a ride around the village in their own special cat stroller. Playing with your cats can be a great summer time activity for your children and their cats. Try it, you’ll like it!